In today's world it often seems that it's vital for us all to be busy, indeed too busy. Happily for me I've arrived at a time in my life where I can choose my level of activity, although when I ponder the past and running a business, that's probably always been the situation. Perhaps it's just being a bit selective and deciding on priorities and not wanting to have it all - immediately? More will become apparent if you have the time to browse this blog, I'm long since retired from paid work and live in the South West of England, amongst other things interested in motorsport. I write about this and other bits and pieces that come to mind whilst also describing the club motorsport sprints and hill climbs I attend in the UK. Everything on this blog is fyrth.com copyright and where known, borrowed images are acknowledged. I can be found here if you want to communicate. How did I become interested in motorsport? As in so many cases it’s inheriting something from the family, my father was an enthusiast, albeit with insufficient funds to become actively involved. From an early age in the 1950s I remember spectating with the family at Brands Hatch and Goodwood and in the 1960s it was Crystal Palace or Silverstone with friends. Before I had a driving licence the Palace was an easy ride on the 137 bus from home at Streatham Hill. These were the days before anyone was concerned about noise, pollution and global warming and the aspiration of most people was to own a motor bike or car and I was no different. I started off with a Vespa scooter and Ariel bike and then, like many in those days, pre-WW2 Austin 7s, £10 to buy and generally in running order, easy to maintain if you had a few spanners, screwdriver and the inclination. It became something of a habit and I always owned one or two and it's only in the last few years I've been without, having lost the pleasure of driving them on today's roads. However they are great fun, with a very actice club movement under the auspices of the Austin Seven Clubs Association. It was Austin 7 Type 65 AOB180 that gave me my first taste of competition, low-key racing with the Vintage Sports Car Club in the late 1960s, everything on a shoe string budget. Sensibly I stopped but the interest remained, plenty of other things to do with my modest income. Still playing with cars Ulster HA7153 was a long term rebuild and then an interesting road car. I followed racing as a spectator, many VSCC events and the occasional Grand Prix in the UK and Europe, drifting back to competition with a vintage special in 1978, again at a modest level, hill climbs and sprints which I enjoyed more than the circuits. This lasted a couple of years but there were other priorities – family, home, education and building a business. I continued to follow hill climbs and started helping out in the 1990s, an excellent way of learning and enjoying more of the sport without the costs of running a car. I was not planning on competing again but one thing led to another and early in 2000 I purchased an early Mallock U2 that Chris Alford was selling for it's French owner. 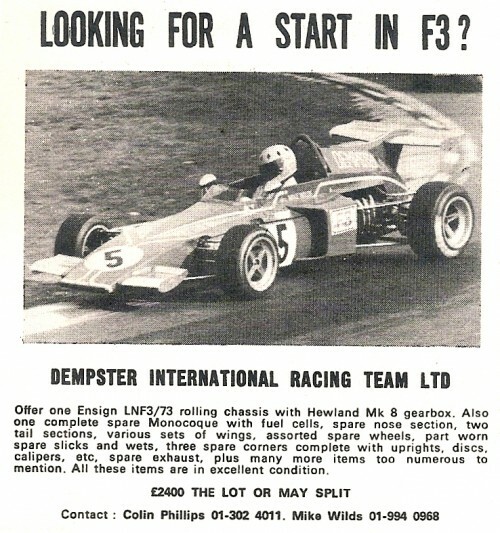 Some 2 years later I heard about a 1972 Ensign F3 for sale in Bristol, all there but in need of a little attention, nothing serious although it had dropped a valve and needed a little TLC as all competition cars do if there have been standing for a while. 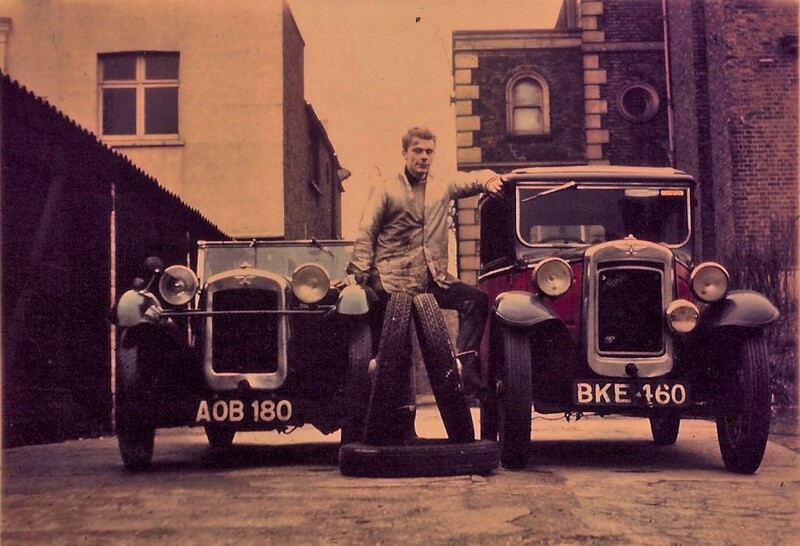 Having always owned Austin 7s and, because of this, a member of the 750 Motor Club in the 1960s, I became interested in the 'specials' that raced in their 750, 1172, and 1200 formulae, absorbing the monthly 750 Bulletin and spectating and marshalling at race meetings. Mallock, or to be historically correct, the U2, was a familiar name, together with others like Milmor, Rejo, and DRW. Therefore, when this car appeared for sale I was a lamb to the slaughter, so to speak, being unfamiliar with what to look for and what to avoid in a competition car. However, I was fortunate as the car was everything that I expected and I can understand why they were so popular and successful in period and excellent for modern classic motorsport. 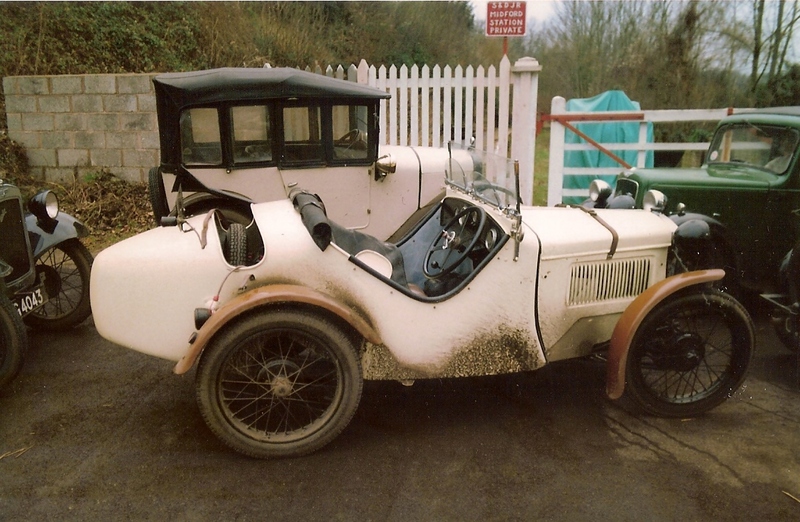 This car is the 5th Mk 2 chassis that Arthur Mallock produced and in those days the chassis and parts were supplied for the purchaser to assemble, choosing their on engine and gearbox. 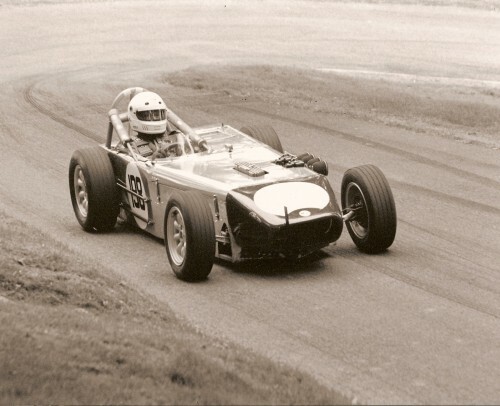 Originally sold in 1959/60 to John Mangolettsi, I've been told that the car was fitted with a competition 1100cc BMC engine and gearbox from Eddie Maher and assembled as a replica of Arthur's Mk 2 when raced as a Formula Junior. If this is correct and if so, for how long this specification remained remains open to conjecture in the absence of any original documentation. Whatever, it's a lovely early sixties single seater that goes well and has no nasty habits, unlike some other cars of the period, 105bhp from the steel 1098cc 3 bearing Ford engine sufficent to be interesting and fun. As with many competition cars, particularly those used for club racing, the history is vague. I believe the plan was to hill climb the car but this is difficult to research as few venues maintain an archive of their early activities. 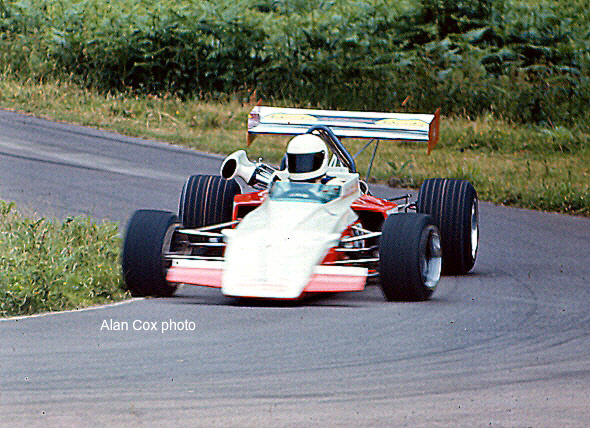 A chance conversation found an owner from 1980 who kindly let me have some pictures of the car, subsequent owners coming to light although nothing much happened with the car until Lawrence Sufryn raced it in Formula Junior events. He'd instigated a comprehensive rebuild, a Ford 109E block (a bit stronger than the 105E but still the 3 bearing crankshaft) sleeved down to 1098cc and Ford 3 rail gearbox with Quaife gears. The front swing axle is actually Ford E93A with coil springs, cut in half and pivoting in the centre and with special hubs, still using using the Ford king pin arrangement. The rear axle is modified BMC with unequal length half shafts enabling an angled prop shaft for more driver space and a wide choice of final drive ratios. This Mallock is a Mk2B with coil springs, 2 forward links and Panhard rod, a development of the Mk2 which had quarter elliptic rear springs and one link inside the body, permanently changing to coil over dampers with the Mk3. This chassis was actually supplied with both and the mountings for the elliptic springs remain. There are drum brakes all round which are effective, twin Morris Minor cylinders at the front and Riley 1500 at the rear. Like many competition cars of this period a Triumph Herald steering rack is used, in fact a selection of components with nothing rare or exotic which is helpful keeping a 55 year old car active in competition. I use the Mallock for speed events - hill climbs and sprints, disciplines of motor sport I prefer although there are Formula Junior circuit meetings everywhere in the UK and Overseas, competition organised by the FJHRA. Whilst currently fitted with the lowest axle ratio - 5.3 or that fitted to the Morris Post Office Van, for those of a certain age, the car is quick with its small frontal area and fine for the wide open spaces of circuits although a little over geared for the hills. That said, the car's times are comparable with classic Formula Fords, the 1100cc pre-crossflow Ford on twin 40s delivering a reliable 105bhp. The Mallock is enjoyable to drive with slight understeer and almost 50/50 front to rear balance, a standing quarter mile of 13.7s with a terminal of 98.7mph making an enjoyable and safe little classic racing car. Good things eventually end and the time's come to pass the Mallock onto another custodian, either to use for classic motorsport and speed events as I prefer, or Formula Junior events where a BMC engine and gearbox are now required. Consequently the Mallock can be sold with or without the engine and gearbox. Priced in line with front engine Juniors there are one or two Mallocks currently competing sucessfully in FJ. With excellent straight line speed due to the low frontal area and predictable handling they are, as I have found, also simple and economical to maintain. Contact me here. As someone remarked at the time, you already have a car! However, life is never that simple and the Ensign came to my notice because a friend was MOTing his rally Imp and Nigel Bigwood, who owned the business, mentioned that he had a racing car for sale. I arranged to return the loaned paperwork about the car and at the same time have a look, acquainted with Nigel through business. The car was on trestles in the rear workshop, dusty and neglected but all there apart from the engine which was on the other side of the country with engine builder Colin Holt in Norfolk. It was not actually love at first sight as I'd difficulty getting comfortable behind the wheel, the set screws securing the bag tank access covers drilling my thighs. With these removed it felt less painful and eventually the deal was struck. Luckily I did not have to move the Ensign far, just as well as the Ensign was a too wide for my transporter; if you need the car a minor problem like this is soon overcome. Two trips were necessary as the car had the usual odds and ends together with a set of body molds, useful to both me and other owners needing odd items due to damage or old age. My new project began and Nigel started driving a trails car successfully in his first season, not to last as sadly Nigel died in February 2005, aged just 51. Once secure in my workshop I had time to fiddle with and learn about the Ensign, something that continues to this day. 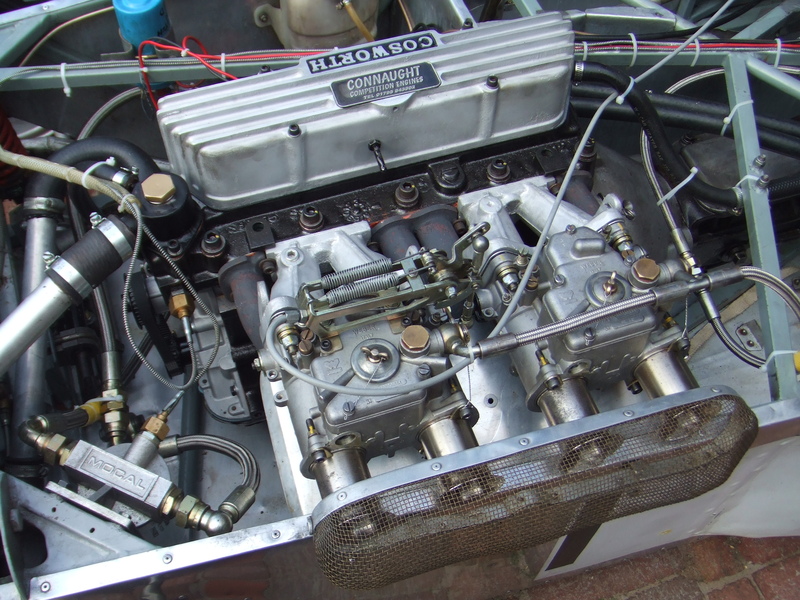 The Holbay twin cam was collected from Wymondham in Norfolk and there has been steady progress of development and occasional disaster. Track time. with copious effort and expenditure has made the car reliable and quick and a pleasure to drive. The car’s history is well documented in Autosport and indeed confirmed by previous owners, most of whom live in the South West. This was recently drawn to my attention by John Cavill, son of the original purchaser Jack. I quote "... and Dad ordered a new Ensign. Ensign were so busy at the time running the works F3 cars and building customer cars that we had to find someone to go to Walsall and build the car. We sent a mechanic Mike Greenwood who I think had worked for Colin Vandervell. He built the car and we continued to run it from Aylesbury. We needed a full time mechanic and Mike knew Colin Bennett who was working for Stan Mathews at the time and persuaded him to come and work on the car. Colin shared my flat for the next two years. Dad bought a new Ford Chassis Cab truck and built the body for it. Mike then found Colin Philips and Sid Pearce of Dempster Developments who came on board as sponsors. In 1973 the Vegentunes were exchanged for Holbay engines. 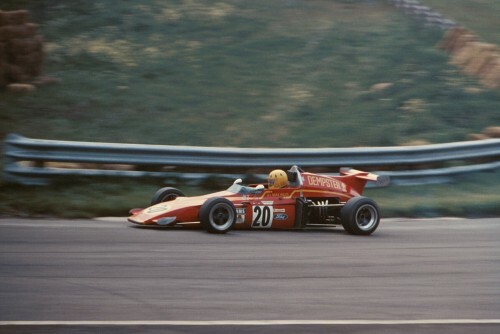 We went to Zandvoort for the F3 race prior to the British GP and Tony Brise told us he was exchanging his GRD for a new March 733. Colin Philips ordered one on his return which Colin Bennett built at the Bicester factory and Mike drove it for the first time without any testing in one of the qualifying heats for the F3 support race. The Ensign was then sold to David Franklin who had previously bought my Vixen VB4 ...". Interesting stuff and since confirmed by Mike Wilds in a talk 7.6.16 near Bristol, Mike actually going on to Dempster's payroll as their professional racing driver. 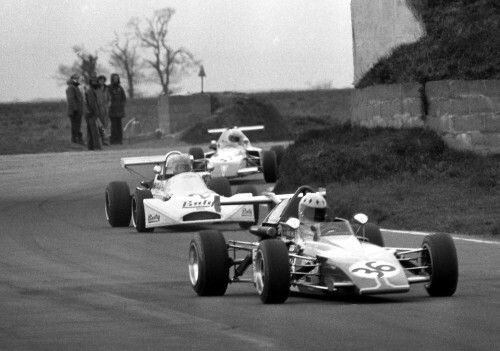 The first outing was at Cadwell Park in July and the car competed at most UK F3 championship events from then until July 1973 including the F3 races during the Monaco GP weekend, here videos A & B give a flavour of the event and plenty of F3 action. Wilds was also at the penultimate event at Crystal Palace on the 9th September 1972, part 1 and part 2 of this epic can be seen, Wilds parking the car in the sleepers at North Tower on the first lap of the F3 final. In July it was replaced with a March 733, then the favoured F3 chassis although I expect there was a good deal to be had with March. Advertised for £2400 in September the car was bought by hill climber and sprinter David Franklin of The Huntsman Garage, Downend, Bristol, succeeding his Vixen Imp. The engine was modified, the F3 inlet restrictor removed but retaining the same cams and fuel injection, 180ish bhp as today. After a while Weber DCOEs replaced the fuel injection. 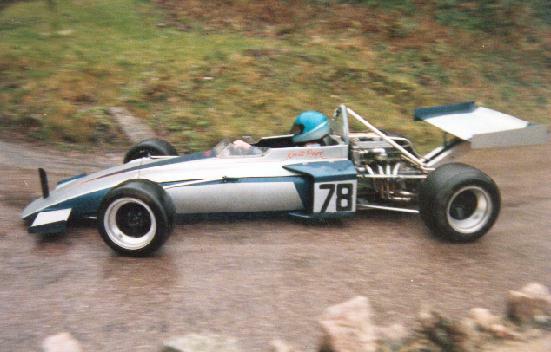 The car's first appearance on the hills was the annual Loton Park test day at the end of March 1973, even a pic in Autosport when this magazine actually reported on hills and sprints. The car continued to lead a busy life with championship success both on the hills and sprints, in those days’ drivers embracing both disciplines with the same car. At the end of 1975 the Ensign moved to Bristol competitor Ted Williams who continued the hill and sprint routine, both he and his son driving the car. A year later and Bob Bailey bought the car, again it not moving far as he was a House Master at Clifton College in Bristol, Pembroke Road just a few blocks away from Williams's business in Hampton Road. Bob did a modest programme of events and sold the car during 1978 to Chris Bigwood who, together with son Nigel, competed in South Western events with some success. This must have taken the eye of Penzance caterer Kevitt Payne who bought the car early in 1981, driving a restricted programme of hill climbs with some great BTD’s and some big accidents, notably at Werrington Park on several occasions, later emulated by the present owner. No surprise here as Derek Lees, Mo Nunn's brother in law who fettled the cars until 1975, commented that Mike's car was one of the most crashed of all the Ensign F3s. Despite this Nigel repurchased the car in 1989 and following a comprehensive rebuild by Ray Rowan he returned the car to the circuits, competing in Classic F3 which has a class for these cars. With the twin cam dropping a valve Nigel was understandably fed up and the car went into hibernation at his Alma Road workshops in the Bristol suburb of Clifton. As Henry Ford opined, ‘history is more or less bunk’, although in the case of old racing cars an interesting list of drivers and events is something which enhances their investment value and allows owners to drive at the smart venues. As a result the identity of a car can be valuable and particularly with the burgeoning professional industry selling their research services to owners. Case in point, this car led a very active competition life from May 1972, plenty of accidents and repairs, even a replacement chassis bought at the same time for convenience, when there was the need to be racing the following weekend. The damaged chassis will have then been repaired, to be used again following anothr accident and in later years one or the other might become another car, or perhaps the same car! All rather confusing really. 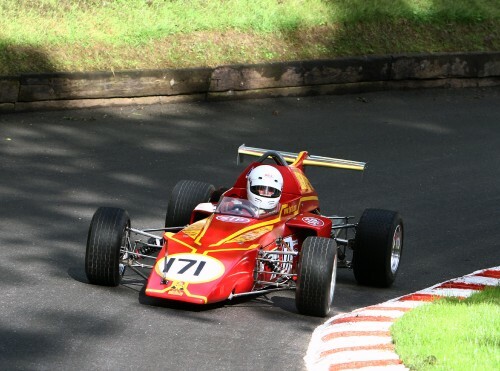 I just count myself lucky having the pleasure preparing and competing with the Ensign at hill climbs and sprints, the car looking much as it did in 1973 at Monaco when driven by Mike Wilds. I even have original Ensign magnesium alloy wheels, although for obvious reasons do not use them in competition. Because of my interest in this car and therefore Ensign F3s in general I'm slowly building a web resource about Ensign F3 cars here.